The study used a manganese-based dye, MnTPP, methyl red, and bromothymol blue to prove the concept. MnTPP and bromothymol blue can detect ammonia while methyl red can detect hydrogen chloride—gases commonly released from cleaning supplies, fertilizer and chemical and materials production. A three-step process "traps" the dye in the thread. 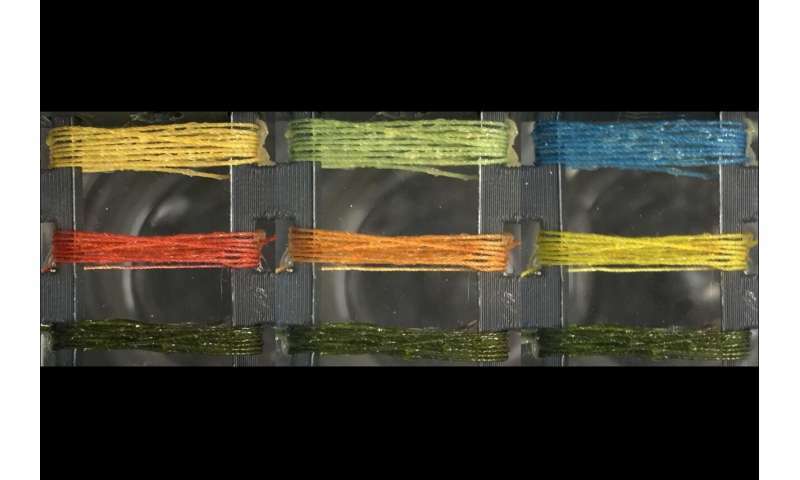 The thread is first dipped in the dye, then treated with acetic acid, which makes the surface coarser and swells the fiber, possibly allowing more binding interactions between the dye and tread. Finally, the thread is treated with polydimethylsiloxane (PDMS), which creates a flexible, physical seal around the thread and dye, which also repels water and prevents dye from leaching during washing. Importantly, the PDMS is also gas permeable, allowing the analytes to reach the optical dyes. Ooooh Gawd!, a fart detector! Schools will demand this fiber in all school uniforms!